Federal Signal’s SemiStat® Status Indicator is designed to meet the needs of the OEM market. The SemiStat is an attractive, easy-to-install and economical status indicator. The snap fit ABS housing cover and a standard terminal block make installation and wiring of the SemiStat a quick job. The attractive and durable ABS housing is available with either a white or chrome finish to complement the machine or location of installation. SemiStat LED light modules utilize extremely bright light emitting diodes for the greatest attention-getting effect. 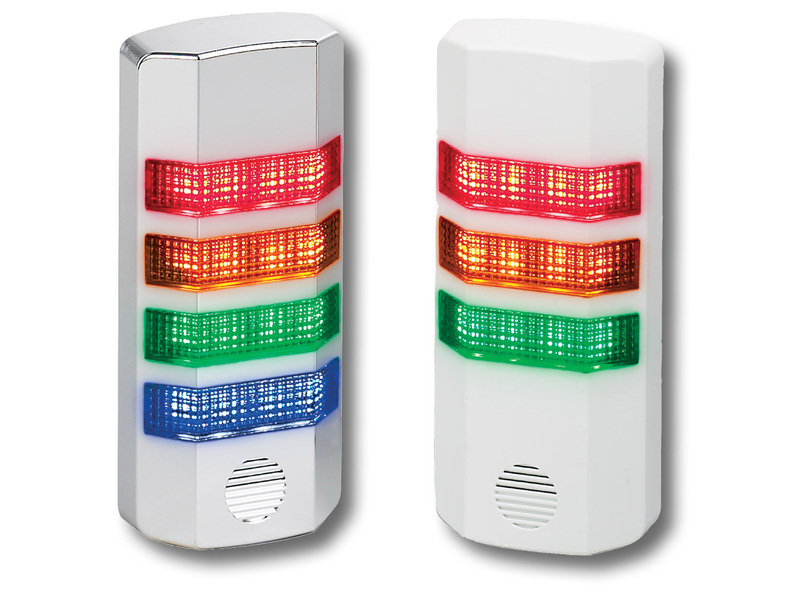 The Tri-Color SemiStat features Red, Amber and Green light modules, and the Quad Color SemiStat features Red, Amber, Green and Blue light modules. Clear LED light modules are available separately. The sequence of the LED light modules can be easily changed to suit the application – just pop off the housing cover, disconnect the modules and reconnect in the desired order. Light modules can be set to flashing or steady burning mode. For further utility, each SemiStat is equipped with an integrated piezo sounder. SemiStat sounders produce 60 dBa at ten feet. A selection of two beep patterns is offered.